Starting GPS Co-ordinates: N51 10' 80" W001 54' 00"
Finishing GPS Co-ordinates: N51 11' 60" W001 52' 00"
To see: Danebury, Museum of Army Flying, The Three Cups Inn. The lane is for the most part well maintained, however the middle section (that between the first and second field boundaries on the OS map) is tighter than the average lane and could do with a bit of clearance. It's not the longest section, and although the paintwork will protest, we've driven far worse than this! On encountering the second field boundary that crosses the lane, the byway breaks free from the shrubbery once-and-for-all, but only because in digging ditches along his field boundaries the farmer seems to have obliterated the hedgerows altogether. 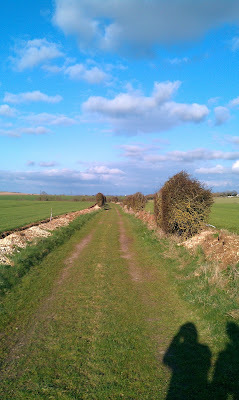 After reaching the summit at around two-thirds of the lane's total length, where it offers wonderful views across the rolling downland to the north and east, this byway begins a comparatively steep descent down to the A30, which it meets just shy of Houghton Down Farm. Worth a drive, but short of the views it's pretty average. For those even mildly interested in history, or even those simply searching for a nice view, the hauntingly beautiful Danebury Iron Age hillfort is worth every second. Definitely go and see it. Just a little further afield, and much more recent, is the Museum of Army Flying on Middle Wallop airbase, with a decent collection of aircraft. Both lie to the north-west of Broughton Drove. For an excellent compulsory after-lane tipple, The Three Cups Inn, just to the east in the pleasant village of Stockbridge, is a great country pub. A small off-shoot of the River Trent flows through the beer garden, the food is great, and they have a decent selection on draught. Go there to unwind, or perhaps even stay the night!